Every year around this time, as I start to plan my Thanksgiving meal and table, I'm reminded of how many special occasions have been celebrated around our beloved old dining room table and chairs, and I realized I've never shared their transformation with you and how I took the plunge to refinish them. 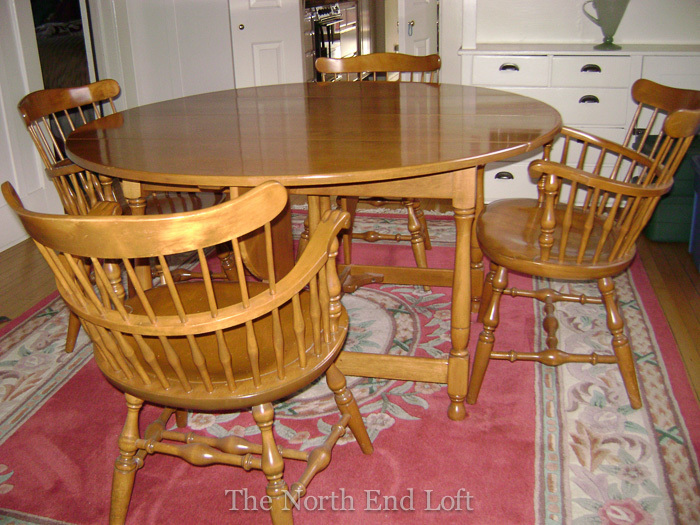 This sturdy maple table and chairs has been in my family for about 75 years. This is how it looked when my parents bought it shortly after they were married. My brothers and I grew up eating dinners on it, and after my mother passed away it found a place in my home where my children grew up eating their dinners on it also. Imagine all the hundreds of happy birthdays, graduations, engagements, Easters, Thanksgivings, Christmases, and New Year Eves that we have celebrated at this table. About five years ago, when I mentioned to a friend that I never really cared for the original reddish maple finish but didn't want to replace our table and chairs for sentimental reasons, she recommended that I paint them. The thought had never even occurred to me before, and at first I thought it didn't seem quite right to paint over our vintage furniture. After thinking about it for a few months, I convinced myself that living with furniture I didn't really like was just silly, for any reason. After searching around the internet and finding out our furniture wasn't special or rare from a collector's standpoint, I started looking for painting ideas and instructions. I discovered from a google image search that black is a traditional color for Windsor chairs. 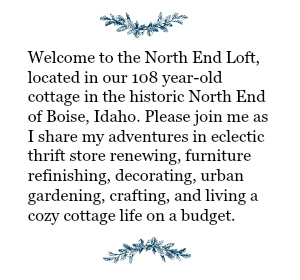 I also discovered my first home decorating blogs and that there was a whole new world of decorating fun out there in something called blog land. I found this post by Rhoda at Southern Hospitality about how she spray painted her own dining chairs with store bought black spray paint, and she made me think, hey, I can do that too! I was so nervous to try such a big project, though! What if I made a mistake and messed it up? I bought all the supplies, and then they sat around for weeks before I finally got up the courage to start. I worked on two of the six chairs each week throughout the summer, cleaning them thoroughly and wiping them down with liquid sandpaper. 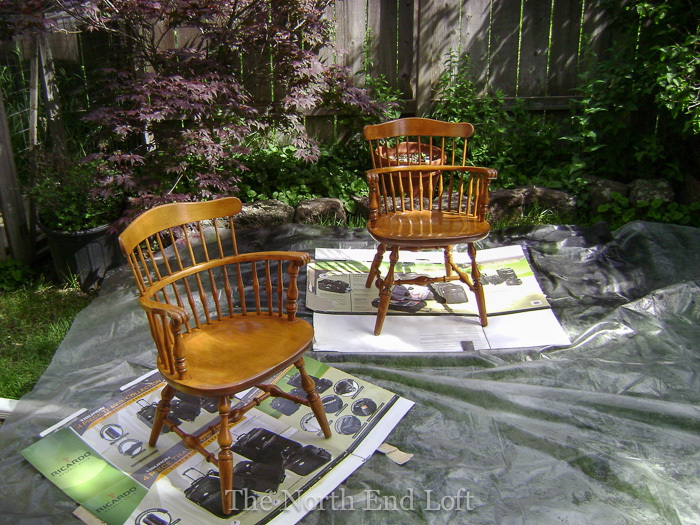 I used one can of Rust-oleum Painter's Touch Ultra Cover 2x (the only spray paint I'll use now) for two light coats of paint on each chair, and one can for the bottom of the table. (7 cans total.) I also used one of those $4 spray can triggers for easy even coverage. It was so scary to pull that trigger the first time, but by the time I started on the second chair, I was gaining confidence and starting to feel like a pro. Other than the time and some significant elbow grease, it was way easier than I thought it would be. 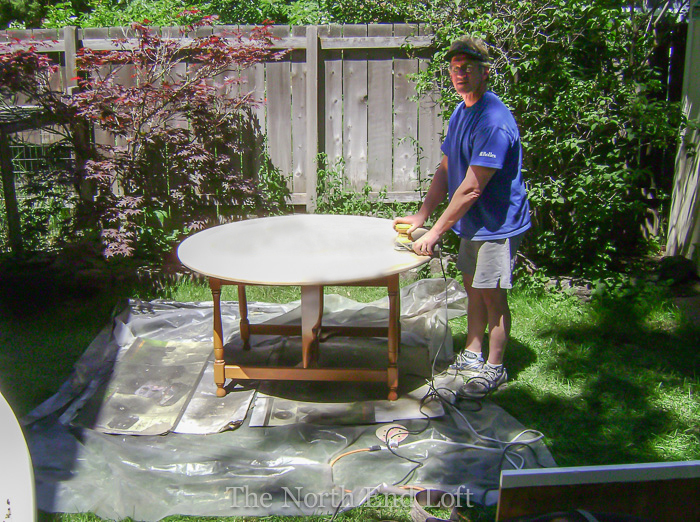 My husband and I took turns sanding the top of the drop leaf table and the four leaves down to bare wood with orbital and palm sanders. We left some of the deep sanding marks on the top to make it look like an old farm table, then I stained it with English Chestnut stain and finished it with many coats of satin wipe-on polyurethane. 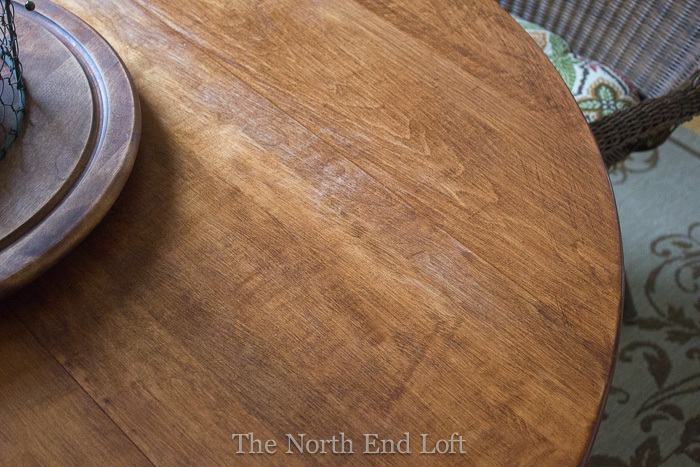 Who knew there was such beautiful grain pattern and color variation with the rustic country look we coveted hidden under that thick shiny red maple stain color? It was love at first sight, and such a gratifying transformation, all for around $100. Since we spend hours at our long family dinners talking way into the night, my husband and I picked out these big comfy wicker chairs and thick chair pads at Pier One Imports to cushion our old-timer buns at the heads of the table, and we now use the original wood chairs for side chairs. When the kids come over we add more chairs and leaves to the table (which seats up to ten), as needed. 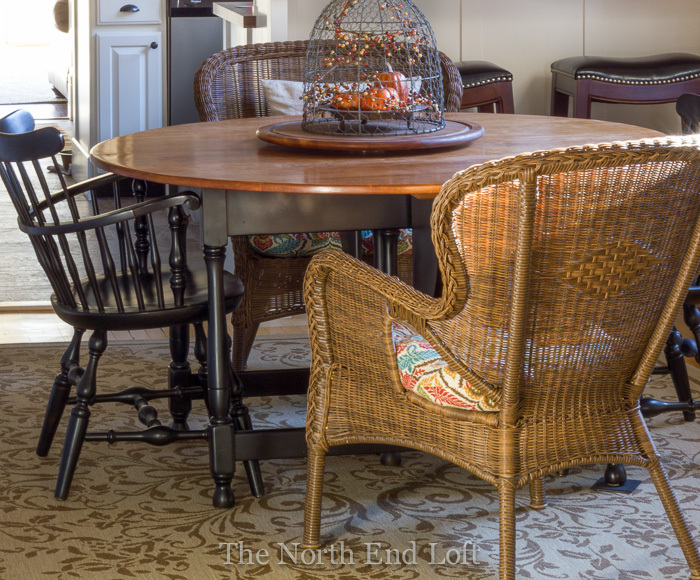 The black Windsor arm chairs are comfortable and useful all around the house when we don't need them for meals. We use one at the small writing table in the family room, one at my husband's desk upstairs, one in the guest room, and one in my husband's man cave. The traditional Windsor lines and neutral black color seem to go with everything in our home, and they make great extra accent chairs. The matching hutch to our set was painted a bit later with a brush and regular black paint. 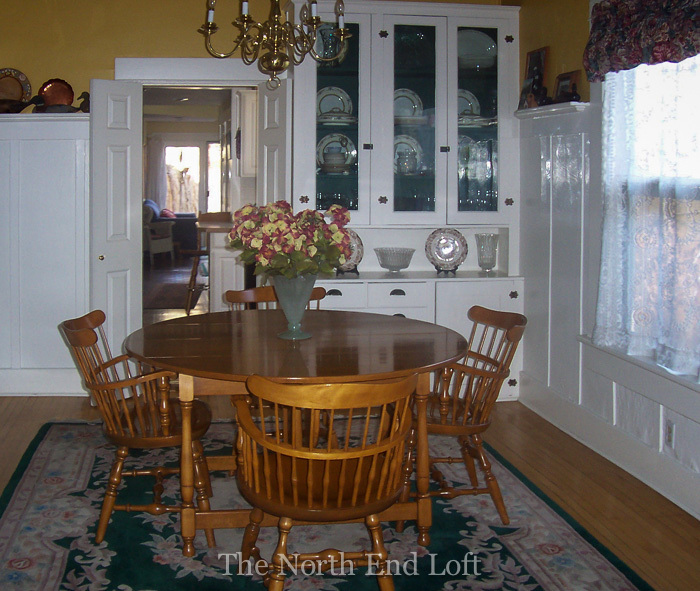 To see some before and after photos of the matching maple hutch, click here. I just love before and after pictures. Here is our traditional dining room from the early nineties. My grandmother's Minton china filled the china cabinet, lace curtains with a poufy flowered valance lined the window, and a thick wool rug cushioned the floor. 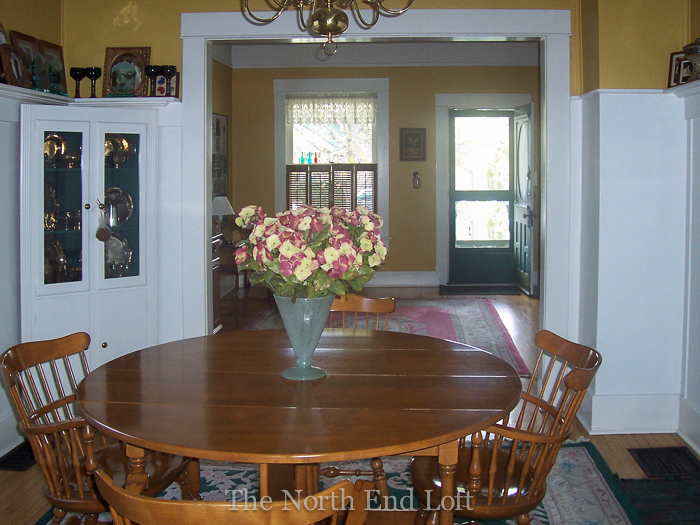 And here is our more eclectic dining room today, minus a wall. 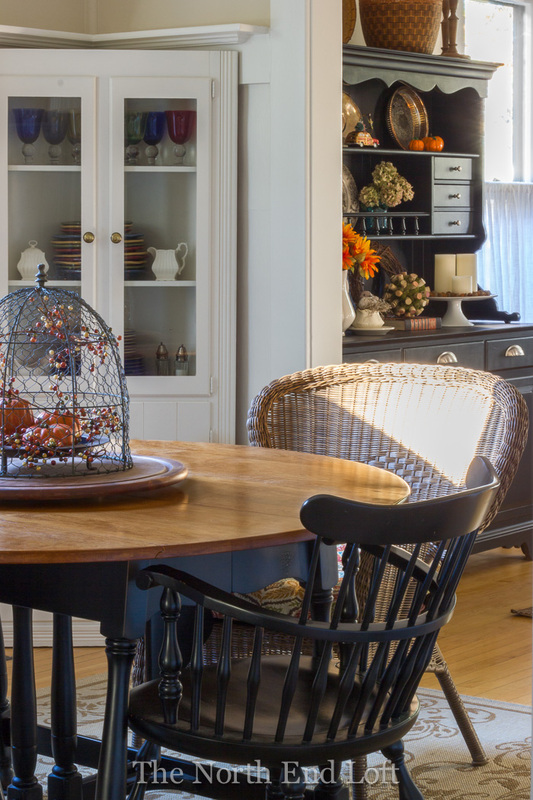 The china cupboard was moved to the kitchen where it holds everyday dishes, a sheer white curtain lets the sunlight shine in the window, and an easy-care indoor/outdoor rug anchors the table and chairs. 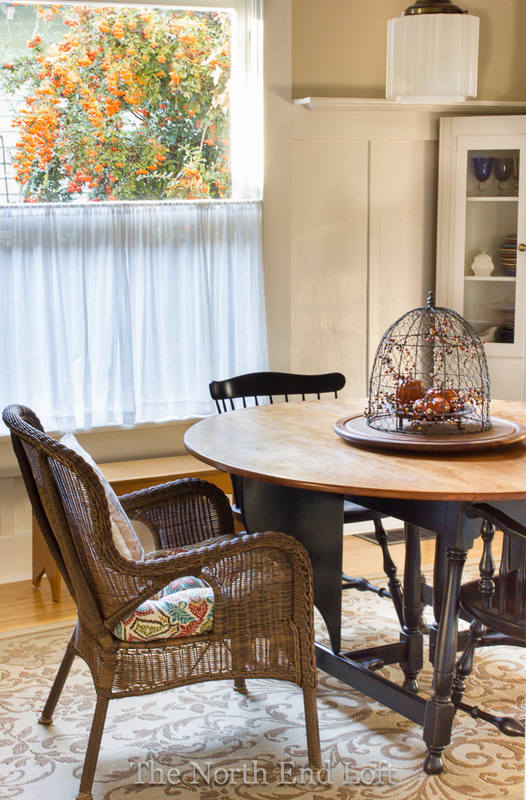 We use our more casual, light, and airy dining room for every meal now. 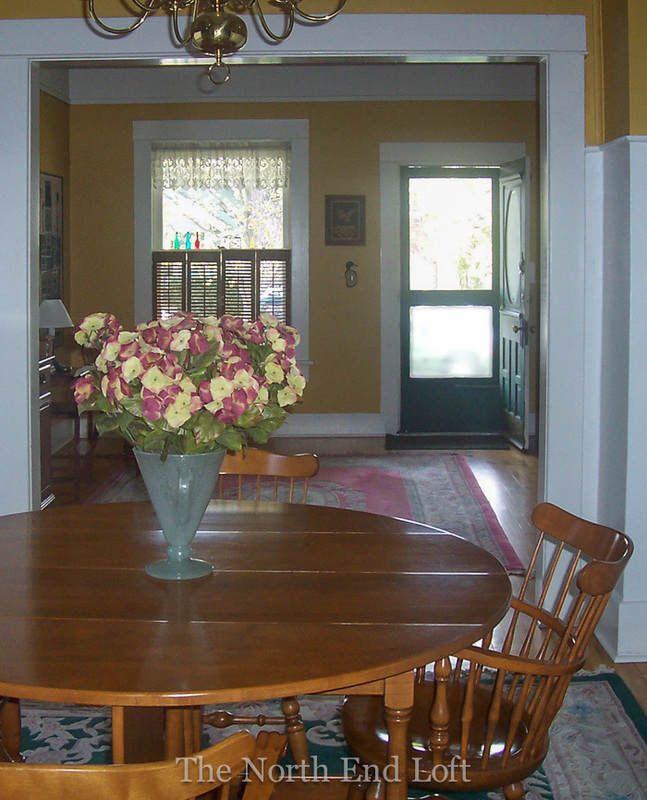 Here are the old dining room table and chairs from the other direction, looking towards the front door. My first chore as a young child was waxing all those spindles once a week. What a difference! 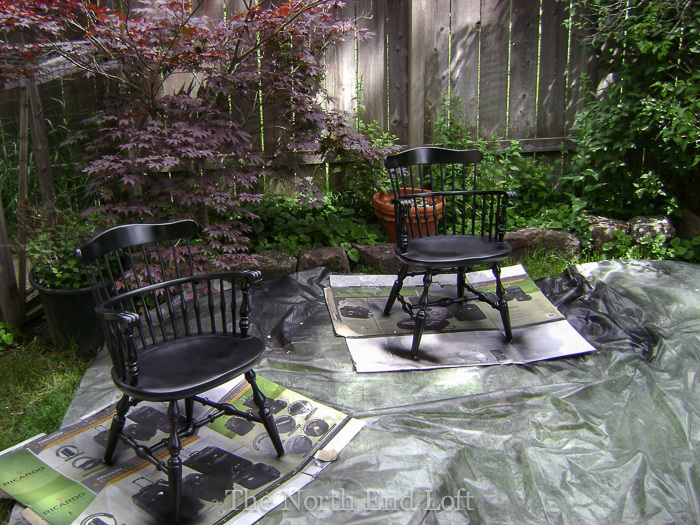 The black spray paint on the chairs and the poly table top have held up well to wear, and no waxing required. I'm so glad I have old photos of how our table and chairs used to look. They hold lots of memories of happy family times together. I'm also so glad I took the plunge to refinish and update these pieces to fit our own tastes and who we are today. The new look doesn't take away from our memories of the past, it just adds a new layer to the history of our furniture and our family. Thank you for stopping by today to take a walk down memory lane with me. I hope you have a wonderful week! Laurel it looks amazing!! I love the black and love the way the table top turned out!! You've proven that it's okay to finish family heirloom furniture in a way that works with your lifestyle, Laurel. I can hardly believe it's the same set! 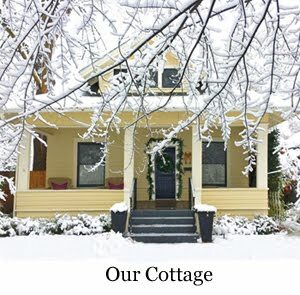 Your home looks just lovely. I love the way it all looks now. Great mix of chairs. It looks amazing. What a difference a little paint makes! How gorgeous they look in black, Laurel! I have to say I think the black does the set more justice than the maple stain. I like how you sanded the top and left that unpainted. Everything looks spectacular! I love those wicker chairs too. Great makeover!! Stunning Laurel! Great new look! I just loved this story. I like the before AND the after / both hold history and memories and are beautiful. Thank you for sharing! I have the table we got as a wedding present 32 years ago. The finish is in bad shape and I've been trying to decide what to do. Now I'm all pumped to paint it and the chairs! 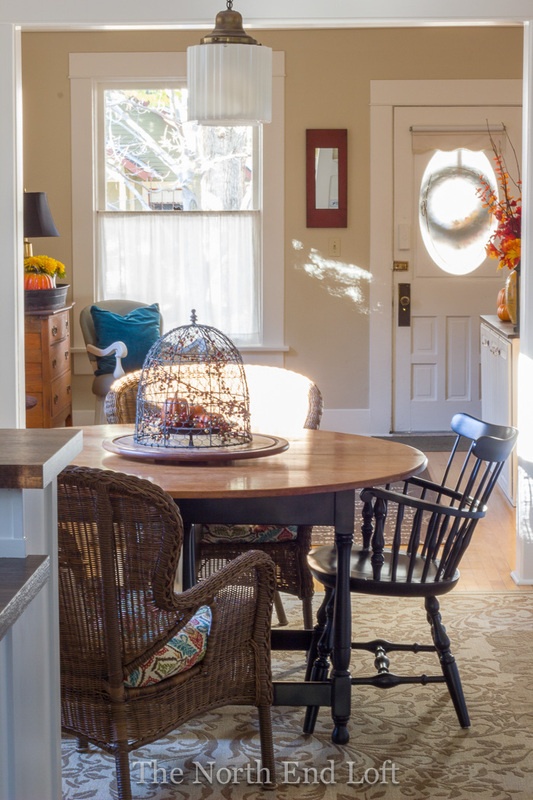 Yours looks wonderful and I love how you updated the whole look of your dining room. Just beautiful! Gorgeous! I'm preparing to paint my kitchen table and chairs, myself, which requires a lot of thought and courage! Great posts like this make me feel better about the whole thing. Beautiful update and still holds all those memories for you! Great job. Oh wow...that turned out great! I love it! Looks fantastic Laurel! My mother also cannot let go of our round dining table at home since it holds so much memories! Glad you got to use it still! This looks lovely! What a total labor of love and now your family heirloom is truly your own! :) Enjoy it! Beautiful transformation - love using black to ground a room. That is an excellent story. You were able to keep the memory's, just in a new finish. 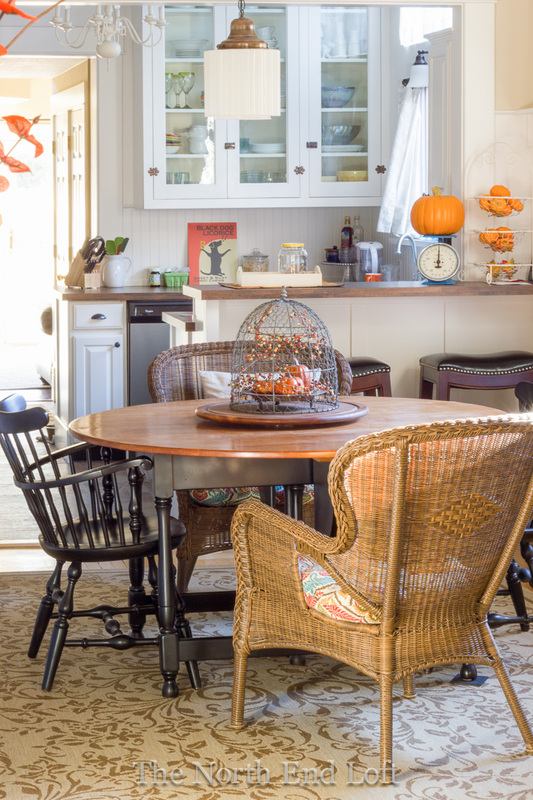 Laurel I love this story of how you kept the family dining table and transformed it into this gorgeous dining look! Great job! I love how you choose to keep the table in the family and create new memories. I also love how you went back to basics and used spray paint. I too use this brand and love it. Black is great and keeping the table top in natural makes both elements pop. Love the room. Now it looks complete. What a beautiful transformation - looks like a totally new set! I need to do this to my table and chairs so badly. What is the advantage of using liquid sandpaper versus regular sandpaper? And, how did you use it...did you sand between coats of paint, or just before you painted? Laurel, it looks like a brand new set. Gorgeous! You guys did an amazing job! Oh, I was so hoping you were going to link this up! It will be featured next week at Home Sweet Home! A perfect Thanksgiving feature!! 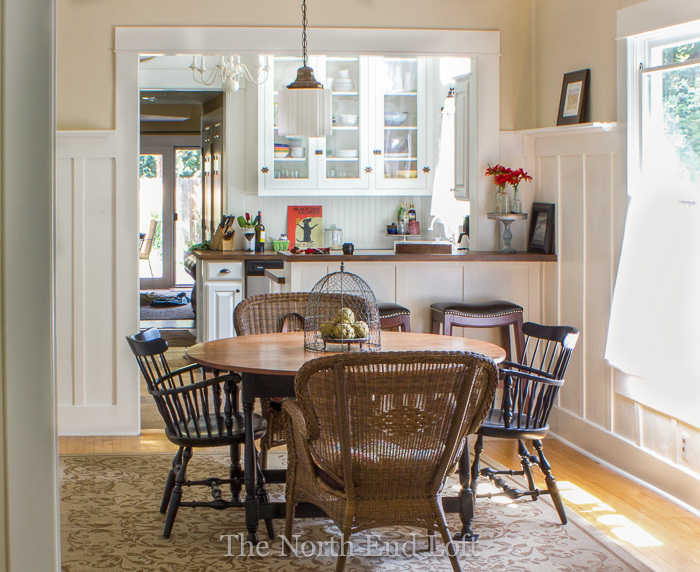 I love your refinished table with the black windsor chairs, one of my favorite chair styles. They look beautiful together! Laurel, that all looks wonderful. 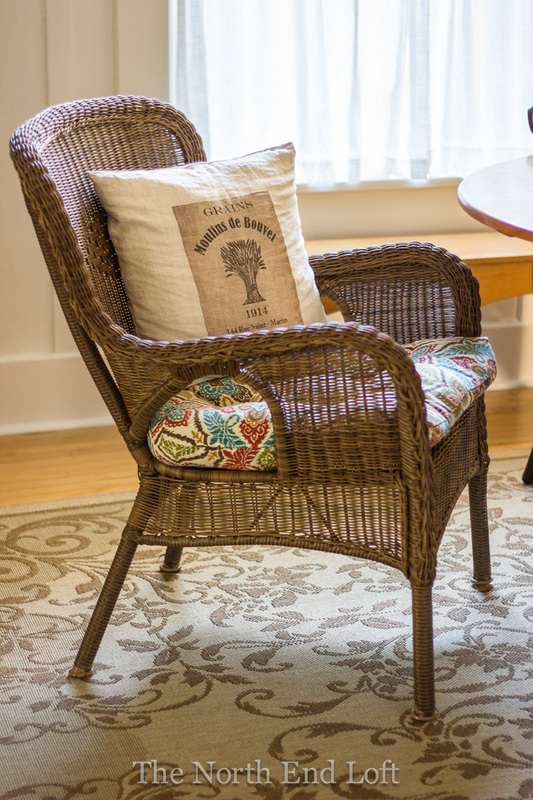 The addition of the wicker chairs gives it so much character. 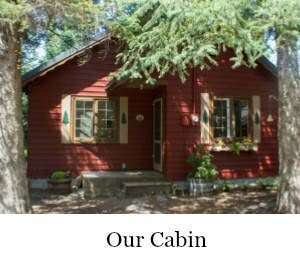 I really love your cottage. Your table and chairs are made by Ethan Allen in America. It was a more expensive line of furniture and will last for generations when lovingly used. You've done a beautiful job. Enjoy. 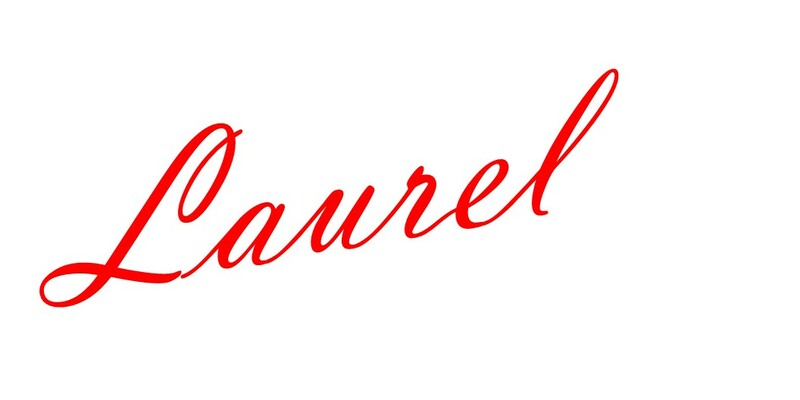 Wow Laurel - how did I miss this post? What an incredible job you did! I love the black! Thank you for this post! I swear I could have written the first part. My parents bought their table in 1954 and to this day we use it but it is so dated. And I've never liked it but it has sentimental value for sure! You've convinced me to paint it!! Yours is gorgeous and I think I can do it too!